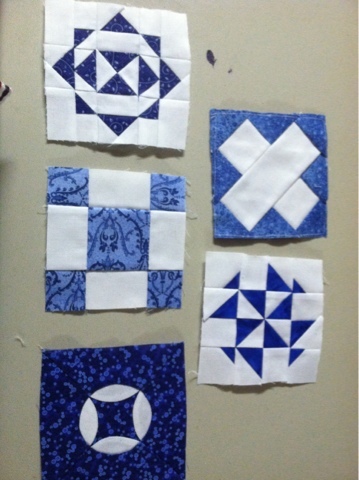 I thought I would share some of the Dear Jane blocks I have done so far. This is block A-1. This was a straight forward easy block. It took a little bit of time but it was entirely paper pieced and easy to do. 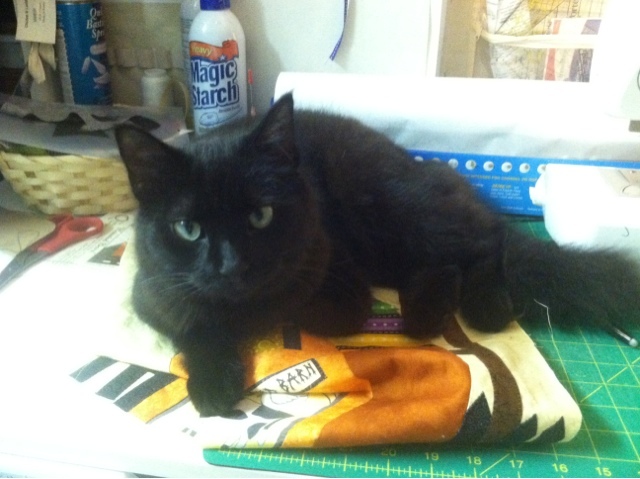 I was trying to work on block two of my Sew Spooky quilt but my cat thought I should pay attention to him instead. I thought I would share a tool I just recently purchased. And fell completely in love with. When I was doing my recent top Garden Patch, I had to piece approximately 500 half square triangles. One thing I learned from doing this pattern is to read all the way through a pattern before you do anything. The first step was to cut all of your fabrics. 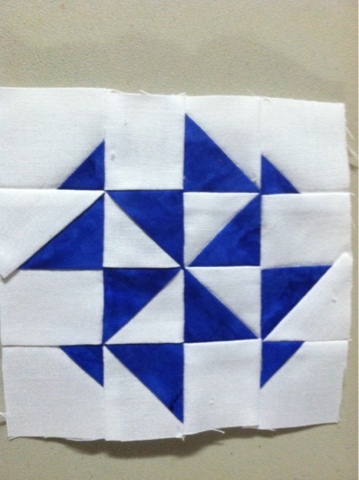 This pattern required you to cut larger squares and then later had you trim them down to make your triangles. If I would have noticed how many triangles I had to trim I would have cut them to the accurate sizes. Anyway, about half way through the quilt I found this tool online. Its called the Bloc-loc ruler. 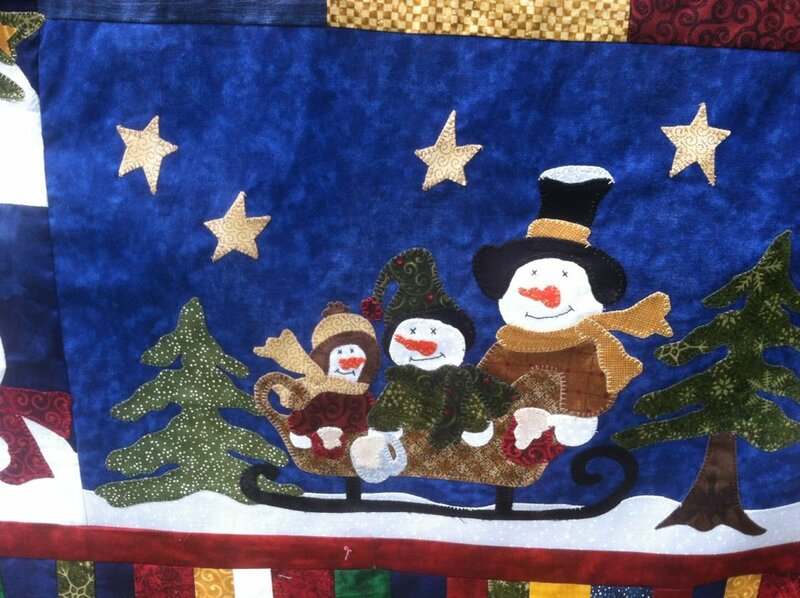 I purchased it from Missouri Star Quilts. I don't think I can even describe how much I love this ruler. If you have to make a large number of half square triangles this is the ruler to have. See that line through the middle? That line is a quarter inch in size and its recessed into the ruler. Your seam line sits perfectly in there. So when you trim your block it doesn't move and the ruler doesn't slide. After you do one corner you simply slide it to the other and turn the block around. It made the process so much quicker. I finished this top this weekend! Yay! And it's even kitty approved! These are bad pictures. I took them with my iphone. I think a new camera might be on my Christmas list. I am going to quilt this quilt in a few days. I ordered batting from Connecting Threads Thursday so it is going to be a few days before I can start it. So this was my weekend. I didn't go anywhere and it was amazing. We have had an extremely busy summer so I didn't make any plans this weekend. I stayed home and sewed almost all weekend. Well in between loads of laundry and house work. I also went through all of my quilting supplies and cleaned some out. I had loads of fabric I bought years ago that just isn't me anymore. Apparently I used to be into florals. A lot. I actually think so of this was given to me by my mom when I started quilting. 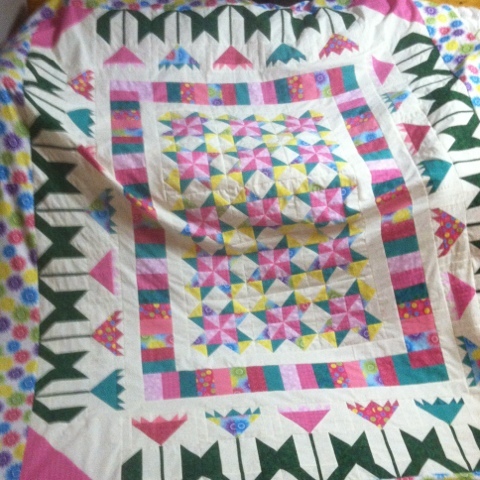 My goal this week is to find someone to donate it to for charity quilts. I know I could just make the quilts myself but its not fabric I could spend any length of time looking at. Does anyone know where I can go to donate or how I should contact? Ok. First of all, don't ever start a blog a month before you get married with the expectations that you will actually keep it updated. So much has happened over the summer. We got married June 22nd and it was a beautiful wedding. We had such an amazing time. My husband is from Reno, Nevada and I hadn't had the chance to meet a lot of his family yet. So getting married in Lake Tahoe gave me the opportunity to do that. They were great and so completely welcoming to me and my children. The kids loved having a whole new family. In one of my previous posts I said I was working on some throws for my new mother in law and sister in law and I promised pictures. Well I goofed and didn't take pictures before I handed them off. They came out great and I think they loved them. I hope they did anyway. I have a few more to make as gifts for some of my other new family members. I have started a quilt for my new niece Clare, who has a birthday coming up in September. 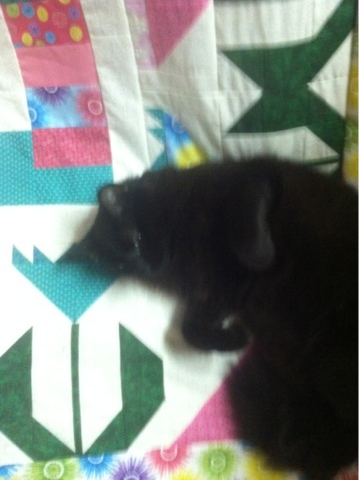 This is the quilt I choose to do for her. Garden Patch. I am using different fabrics though since I have the pattern already from the magazine. I hope she likes it. My new brother-in-law is moving in a new house sometime soon so he will need a throw for his living room. And then I have one sister-in-law left that I don't have anything picked out for yet. So, even though I wasn't posting a lot this summer I sure was sewing a lot. I only have a couple hours every evening to sew so I didn't want to use that time blogging. But I decided to make myself sit down and get better about this. I really want to keep a record of what I am working on and what is going on in my life. I want my quilts to have a story. There is one other thing I want to share. I finished this quilt top a couple weeks ago. I have had it as a UFO for about 5 years. And I am not kidding. It was a block of the month that I was never able to keep up with. Its called Hot Chocolate. I did it all using machine applique. I had a hard time finding a fusible I really liked so there are about 5 different paper backed fusible's in there. 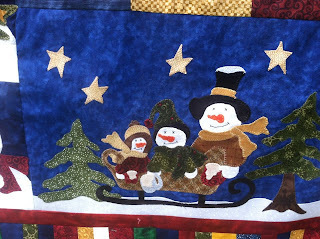 I used Heat-n-bond, Steam-a-seam, Soft Shades, and Applique Fuse from Marathon Threads. I thought there was another but it escapes me now. I just couldn't find one I liked. Either it was stiff and stuck really well or soft and would come un-fused halfway through doing the block. I am still undecided on my favorite but I think its between Soft Shades and Steam-a-Seam. Here's some detail shots just because you can never have enough snowmen. Well even though I have so much more to share from this summer, this post is getting super long. I have a few other works in progress that I need to show you but I want to take some better pictures. I hope you all are having an amazing and productive summer as well! For years I was a single mom. And even still I can't afford to buy the huge expensive sewing machines that most quilter's love. I do all my piecing and machine quilting on a brother sewing machine that was bought at Wal-Mart. I think it was $125 dollars new. And to be honest I never have problems with it. Its a good little machine. Yes, I would love to buy a nicer one but right now its not in the cards. I would also love to say I buy I buy all my fabric at my local quilting shop. But seriously, who can afford $12/yard for fabric. Not I. I spend my time shopping online to cut my costs practically in half. I ventured in to my LQS the other day to kill sometime before I had to pick up the kids from their after school activities. I loved, loved, loved wandering around the store looking at all the wonderful fabrics and patterns. I really wish I could I could do more to support their presence in our community. But as a young adult I can't. Quilting is a bit of an expensive hobby to get into. And its generally known as being a hobby enjoyed by a generation that is older. And honestly I can see why. So where do you buy your fabrics? Here are some of the sites I love for great deals. I love the clearance and sale sections most of all. 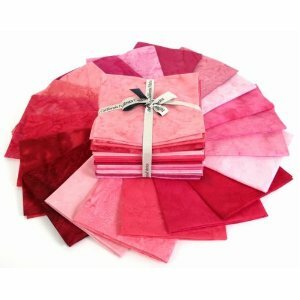 I generally try to buy last season's fabrics or lines of fabrics that have been out for awhile. I am also lucky enough to live 30 mins away from a salvage surplus store that has the most amazing fabric department. I don't always know the name brand of the fabric I am buying but it has never disappointed me. 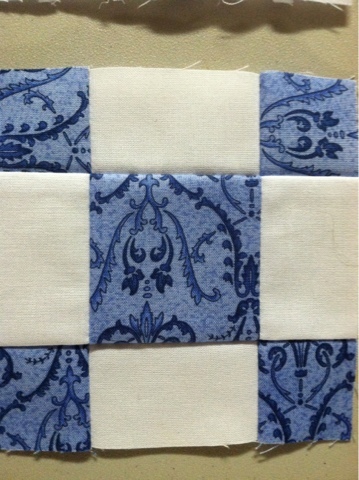 I picked up 10 fat quarters the other day for my blue Dear Jane quilt at 75 cents each. They must have about 500 bolts of fabric there. I will have to take some pictures next time I go. So let's share where we go to get our deals. 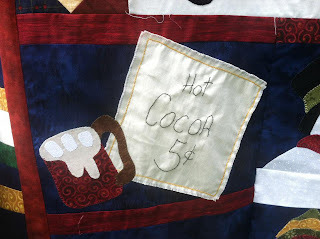 How do we pursue our love of quilting on a budget? About 6 years ago I made this hall hanging for a friend to hang in her living room. My only direction was green. I can't seem to remember where I got the design from but I think it was on my Electric Quilt 6 software. I remember being so excited. It sold for about $40 dollars. I don't have much time for a lengthy post but I wanted to get some pictures up of my Dear Jane work so far. 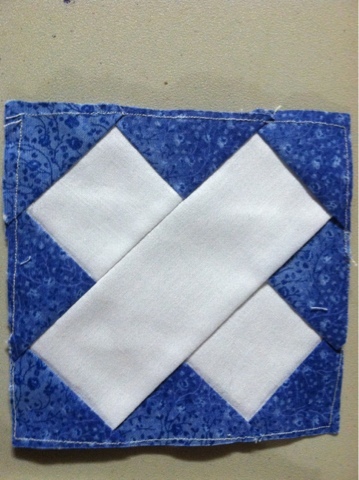 My quilt is going to be all blues and whites. I was really torn between doing a pink and chocolate one and this one. My fiance voted blues, so there you have it. I am still collecting pinks and browns though and maybe someday I will do that one too...or maybe just a smaller one. Most of the ones below I paper pieced. 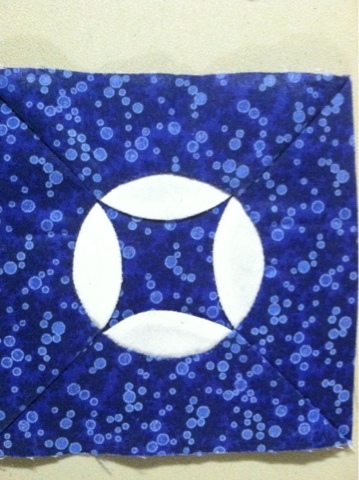 The hunter's moon block was mostly hand applique. I enjoyed that block a lot. 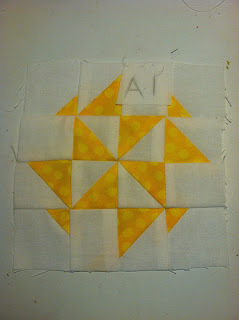 I learned how to reverse applique which I had never done before. I get most of my hints and tips from That Quilt. I almost forgot the good news. I received an early mother's day gift today. My wonderful fiance and kiddos bought me the Dear Jane Software! I think the fiance got sick of me complaining about all the tracing that I was doing with the book. My first post. I am sitting here trying to think of exactly what to say that might start to grab an audience. And I don't have a clue. 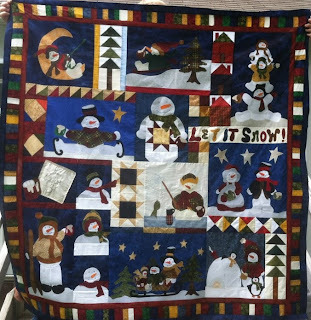 Should I show some pictures of previous quilts I have done? Show pictures of stuff I am working on? I have decided I would tell you a little bit more about myself. My life is pretty exciting right now. I am getting married next month! I have two kids from a previous relationship that just adore my fiance and I couldn't be more excited. We are having just a small wedding with close family and friends and getting married on the shore of Lake Tahoe. This is the issue it came from. I actually had to buy the digital version because I lost my paper copy. Anyway, when I originally made it I used a chenille that was wavy. And now apparently, they no longer make the wavy chenille in a beige or natural color. And I really, really, really wanted it. I have been hunting for weeks. I did finally find it a few days ago but at the steep price of 18.99 a yard. Ouch! But its now ordered and its on its way. These throws are super quick to put together once you have all the needed materials. 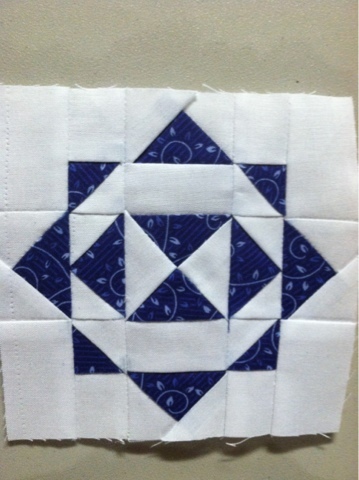 Have a good day and Happy Quilting!